If you’re new to web accessibility, you’ve come to the right place. I made this website to simplify the world of web accessibility, so that everyone can understand it. I want you to know that web accessibility isn’t as hard as it seems, and the benefits to your website are huge. I’ll show you how good web accessibility can keep your website legal, save your costs and make you money. With the right guidance, you can’t go wrong when it comes to web accessibility. Many of the things that help your customers with disabilities are common sense changes that help all of your users. Once you see the principles of accessible web design broken down and explained, you’ll soon understand what you need to do (and how much money you’ve left on the table). There’s nothing more powerful that a little education, so I’ve prepared a few articles that will help you learn more about web accessibility. Read through these at your leisure (in the order below works best) and start your journey to making a better website for you and your users. Start with What is web accessibility? for an overview of what web accessibility is, why it’s important and how you can benefit. 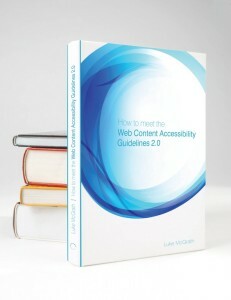 Next, read What are the Web Content Accessibility Guidelines 2.0 for a clear explanation of what the guidelines are and why they’re internationally recognised as the standard for web accessibility. When you’re ready to get started, I suggest taking a look at my WCAG 2.0 checklist to start structuring your plans. You don’t get where you want to go in life without a map and my checklist will help you plan your first moves. If you’re the kind of person who wants everything at once, and likes to make their own way, my book might be your best bet. It talks you through all the guidelines and offers advice on how to structure your approach to make web accessibility an efficient process. You’ll save time by knowing how to build accessibility into your projects from the start – and how to audit existing projects for improvement. It’s called ‘How to Meet the Web Content Accessibility Guidelines 2.0‘. If you’ve got any questions about web accessibility, the WCAG 2.0 or Korean cinema, I’m here to help. Just send an email to luke@wuhcag.com and tell me what your biggest concerns or difficulties are (I have watched a lot of Korean films, my favourites are probably Oldboy, The Good, the Bad, the Weird and Bedevilled). You can also get in touch with me on Twitter, Google+ and LinkedIn (whichever is your bag).